US Secretary of State John Kerry was taken to a hospital by helicopter after Sunday’s incident. WASHINGTON — Secretary of State John Kerry is scheduled to arrive in Boston on Monday to receive medical care after breaking his leg in a bicycling accident in France, cutting short a European trip and adding another complication into the final push for a nuclear deal with Iran. Kerry broke his right femur Sunday morning while cycling in the Alps near Scionzier, France, about 30 miles from Geneva, where he had earlier wrapped up a six-hour meeting with his Iranian counterpart, Mohammad Javad Zarif. Paramedics and a physician were traveling with Kerry’s motorcade at the time of the accident, and Kerry was flown by helicopter to Hospital University Geneva, according to a State Department spokesman. Kerry, 71, never lost consciousness, and is expected to make a full recovery, the spokesman said. He was injured when his bike hit a curb; no one else was involved. Because the injury is near the site of a previous hip surgery, Kerry decided to return for treatment at Massachusetts General Hospital with Dr. Dennis Burke, who several years ago performed hip replacement surgery on both of Kerry’s hips. The fracture is near the hip, and it will likely require surgery that is expected to be performed by Burke, according to a State Department official. “Secretary Kerry is in good spirits and is grateful to the French and Swiss authorities, doctors, and nurses who assisted him after the accident,” spokesman John Kirby wrote in a statement. Kerry had been planning to fly to Madrid on Sunday afternoon before heading to Paris for a meeting with foreign ministers on Tuesday to discuss ways to fight the Islamic State. 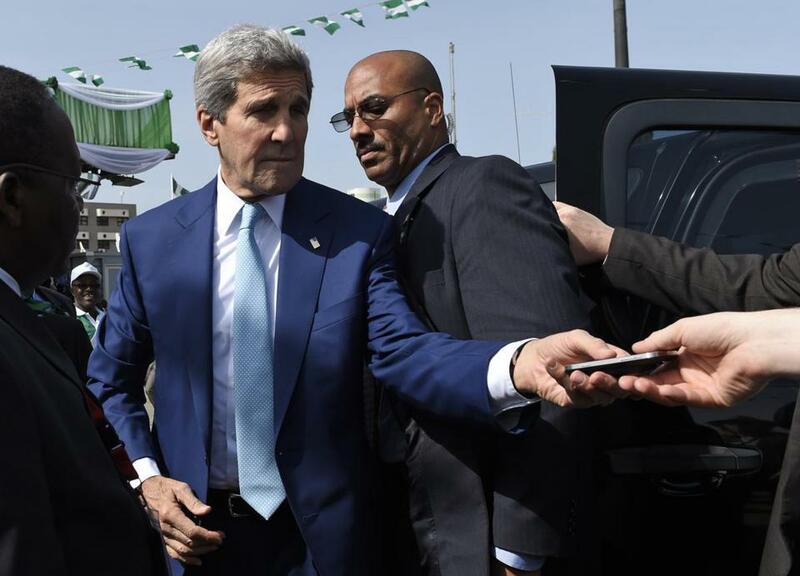 Kerry is still planning to participate in the Paris talks remotely. More pressing is the talks with Iran. Kerry is spearheading the final negotiations over a nuclear pact that would restrict Iran’s activities in exchange for lifting economic sanctions against them. The US-led framework deal was agreed to in early April, but the deadline for the final terms is June 30. If a final deal is reached, Kerry’s stamina will be tested in trying to dampen opposition from Israel and convince a skeptical Congress not to try and kill the deal. State Department officials did not address how Kerry’s injury may affect the Iranian negotiations, or his ability to play a role in them. The deal with Iran has been one of the primary focuses for Kerry, and it would likely be seen as his signature accomplishment if it is achieved. He has also focused on reopening diplomatic relations with Cuba, and a trip to reopening a US Embassy in Havana could be on the horizon. Kerry has kept up a dizzying pace over the past two years, traveling nearly 820,000 miles and visiting 63 countries. He’s spent 1,780 hours — some 74 days — in the air and his legacy so far has been defined by an energetic pace his much younger aides have trouble maintaining. This is the first time he’s been sidelined due to his health. It is unclear how severe the fracture is, and how long it will take for Kerry to recover. It can take four to six months for a broken femur to fully heal, according to the American Academy of Orthopedic Surgeons. The femur, which is also known as the thighbone, is the longest and strongest bone in the body and it usually takes significant force to break it, the academy says. Although Kerry would be on crutches or in a wheelchair during a signing ceremony with Iran — if there is one — it’s not a situation the man with a lifetime of sports injuries hasn’t confronted before. In 2012, he showed up for a ceremony at the White House with two black eyes and a broken nose, the result of a injury he took when he was smacked in the face with a hockey stick. Kerry is a long-time cyclist who, when he’s in town, has been known to frequent Belmont Wheelworks for repairs on his titanium Serotta Ottrott. He uses it for exercise, to clear his head, and, at times, to conduct deals. In 2010, when then-Senator Scott Brown was waffling over whether to support a financial regulatory overhaul, Kerry took him on a 40-mile bike ride around where they came to terms. As Secretary of State, he often travels with his bike (as well as his guitar), and he usually has a stationary bike in his hotel room. He has done the 111-mile Pan Mass Challenge, which raises money for cancer research, about a dozen times. During the last round of negotiations with Iran, Kerry was known to depart on bike rides in Lausanne, Switzerland, heading for the hills with his longtime aide and biking partner Jason Meininger and occasionally stopping at local shops for emergency repairs. Local officials told the French news service Agence France-Presse that Kerry had asked local officials several days ago to organize a trip through the Col de la Colombiere. The Alpine pass is a steep climb that has been featured a number of times during the Tour de France. “He fell accidentally, like all other cyclists have at some point,” an official told AFP. The accident occurred at the beginning of the ride, when Kerry hit a curb. He wasn’t going fast. Kerry remained at the hospital in Geneva on Sunday, while his government-issued aircraft departed with the aides and journalists who had been traveling with him. He was originally planning on flying to Boston on Sunday evening, but later postponed that flight. Matt Viser can be reached at matt.viser@globe.com. Peter Schworm can be reached atschworm@globe.com.